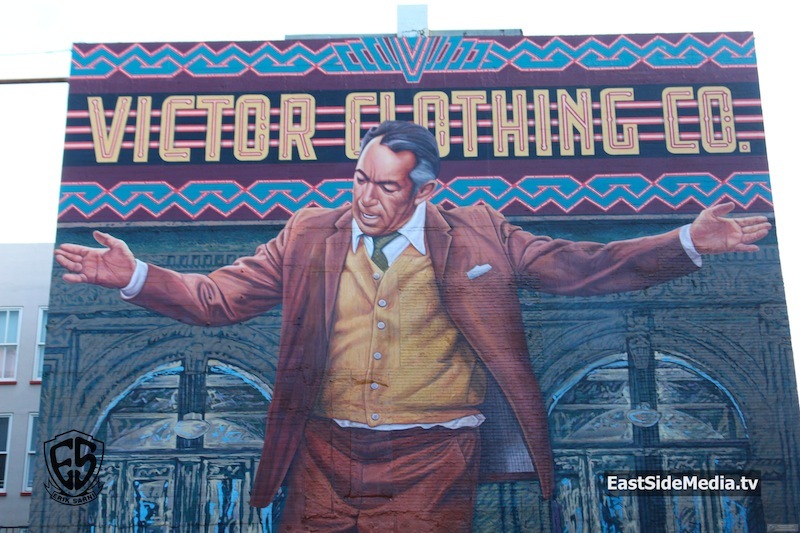 The looming portrait, which graces a side of the Victor Clothing Company building, was first painted in 1985. According to KPCC, the company had wanted to tip its hat to its Latino clientele, and the bigwigs turned to muralist Eloy Torrez for ideas on what the subject matter would be. “We’d talked about what Latino that I think would be the equivalent of a Humphrey Bogart, Fred Astaire. For me it was a no-brainer,” said Torrez. His mind went to Anthony Quinn, the Mexican-born actor who’d gained prominence through classics such as Lawrence of Arabia and The Guns of Navarone. Quinn was born in Chihuahua, Mexico in 1915 to a half Mexican, half Irish father, and a half Mexican, half Native American mother. His family relocated to Los Angeles shortly after his birth. Despite the fact that he’d lived as an American for the majority of the life, he was forever cast as The Other. In fact, he landed one of his first roles (in 1936’s The Plainsman) by pretending to have Cheyenne ancestry. And from there he “hardly ever played an American, except a native one. His most famous portrayals were as Greeks, Mexicans, Frenchmen, Italians, Arabs and even an Inuk,” according to the Guardian. He won the Oscar for Best Supporting Actor for 1952’s Viva Zapata! (which had a screenplay penned by John Steinbeck!). Here, Quinn played second fiddle to Marlon Brando’s Emiliano Zapata, who was gussied up with a mustache, a sombrero, and a seemingly exaggerated tan. It was Quinn, however, who took home the honors at the Academy Awards (Brando was nominated but lost out to Gary Cooper for his role in High Noon). Quinn’s second Oscar came for his portrayal of post-Impressionist painter Paul Gauguin in 1956’s Lust For Life. In the 1950s, the Million Dollar became the first theatre on Broadway to feature Spanish-language variety shows (variedades), including headline acts from Mexico City and Latin America. The theatre served as a leading Latino entertainment venue for decades, featuring variedades and Mexican film premieres. “The Pope on Broadway,” then, is not just a celebration of Quinn’s work. It’s also a reminder of his ties with the Latino community in L.A., and his place in history as a trailblazer. Quinn passed away in 2001. According to the L.A. Times, the restoration project comes with Huizar’s “Bringing Back Broadway” program, a 10-year plan to return Broadway to its halcyon days as a glitzy thoroughfare. This project helped usher in the return of Grand Central Market, as well as plans for more pedestrian walkways (there’s also a proposal for a streetcar that’s seen its share of bad press). For the mural, Huizar had secured $150,000 in funding from Chinese developers Greenland USA, which is responsible for the massive, upcoming Metropolis development in downtown. So who was selected to handle the restoration? Torrez, of course. Speaking to KPCC, Torrez said that he’d expected the project to come with a dose of nostalgia. “It’s going to be interesting. It could be a time travel experience, maybe. I can be 27 again, up on that wall,” said Torrez. The Victor Clothing Company Building is at 242 S. Broadway in downtown Los Angeles.